Home / FCASD News / Our State Champion! 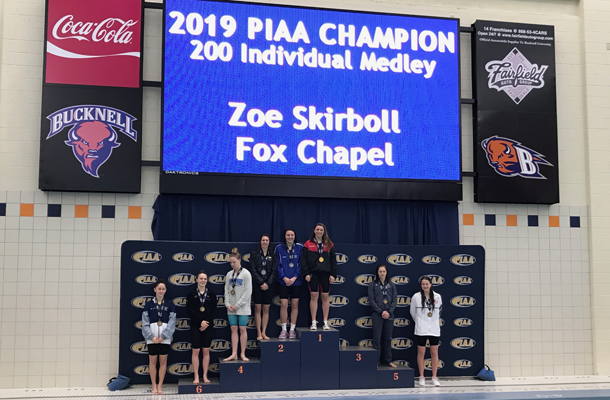 What a great time of life it is for swimmer Zoe Skirboll! 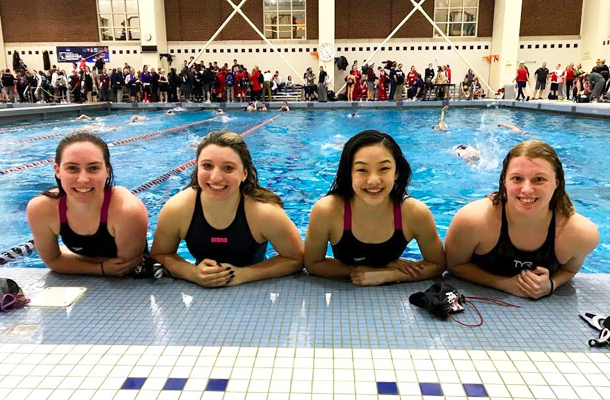 The freshman broke four school records this season, set a new WPIAL record in the 100 breaststroke, surpassed the previous record in the 200 IM, and now is Fox Chapel Area High School’s first PIAA gold medalist in swimming in 24 years. Zoe also won the silver medal in the 100 breaststroke at states with a time of 1:01.23. Her finish was one-tenth of a second behind winner Laura Goettler of Butler. That’s basically the equivalent of the blink of an eye. Fox Chapel Area only has earned three individual gold medals at the state level. In addition to Zoe, Etta Van Der Weijden won the 200 freestyle in 1995, and in 1981, Linda Krumwiede finished first in the 100 free. Also, the 1995 girls’ 400 freestyle relay team brought a gold medal home to Fox Chapel Area High School. Here is a list of Zoe’s record-setting accomplishments with the team this season. But Zoe’s success has also has come with a lot of sacrifices. Zoe’s first PIAA experience started with the 200 IM race. Swimming experts say there is no other race like the 200 IM to expose a swimmer’s greatest strengths and weaknesses. The event includes legs of four different strokes: the butterfly, backstroke, breaststroke, and freestyle, in that order. It’s also the race that many college coaches look at to evaluate future recruits because it is a great test of stamina, skill, and endurance. Even so, she had a case of the jitters beforehand. “I was really nervous, but I kept thinking that I had to just trust in my training and I’d be fine,” Zoe says of her demeanor before the race began. “Sometimes nervousness can be used for good. Toward the end of the race, she experienced some tightness and pain in her legs, but swam through it like the champion she is. Zoe really wanted to win the 100 breaststroke. It’s her trademark stroke and the one she feels most comfortable swimming. But after competing in four races the day before, Zoe says she felt a bit tight going into the second day of preliminaries. “That’s not what I wanted to feel,” Zoe says with regret. She also had very high expectations for herself and was feeling some self-imposed pressure. After breaking the WPIAL record, she was the number one seed going into states, but was upset with her time in the preliminaries. “This is the race I had my heart set on and I definitely am the kind of person who puts a lot of pressure on myself,” admits Zoe, who knows that improvement comes with not only wins, but losses as well. Zoe will miss that camaraderie as she now moves on to competition at the national level. 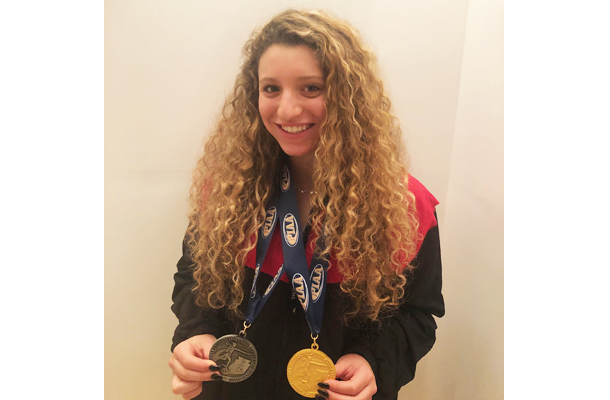 Two days after states ended, Zoe was headed to Orlando, Florida, for the four-day USA Swimming-sanctioned 2019 National Club Swimming Association Spring National Swimming Championships. It’s a grueling schedule, but it’s a way of life for Zoe and other students across the country who are ultra gifted athletes. “By now, I’m kind of used to doing one meet after another,” she says. At nationals, she’s taking on an aggressive schedule. She reeled off a list of the races ahead of her. She’ll be swimming in the 50 breast, 50 fly, 50 free, 200 fly, 100 free, and the 100 and 200 breast. Since USA Swimming event times are qualifiers for the Olympics, Zoe is hoping that she’ll do well enough to make the 2020 Olympic Trials that will be held June 21-28 in Omaha, Nebraska. Currently, she is under a second away from the 100 breaststroke qualifying time. No matter what happens in the future, 14-year-old Zoe has been an inspiration to her Foxes’ teammates and has been a pleasure for spectators to watch all season.